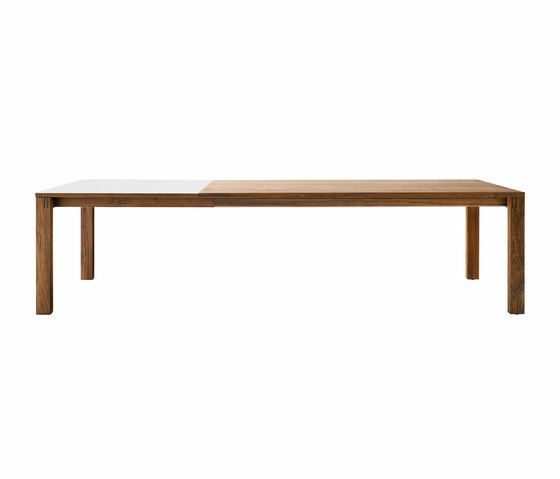 No fewer than two design awards have been conferred on the popular magnum table, which is available with or without extension. The extending magnum table is fitted with the patented 2soft mechanism which can be operated with just one hand. The extension mechanism developed by TEAM 7 is symbolic of the company's great innovative capacity. An integrated insert allows the magnum table to be conveniently extended by 50, 2 x 50 or 100 cm to a maximum length of 350 cm. Stability is guaranteed by high-quality craftsmanship including such features as slot-and-tenon connections which particularly emphasize the characteristic properties of the natural wood. The table and inserts are available in seven different types of wood and nine glossy or matte glass colours.